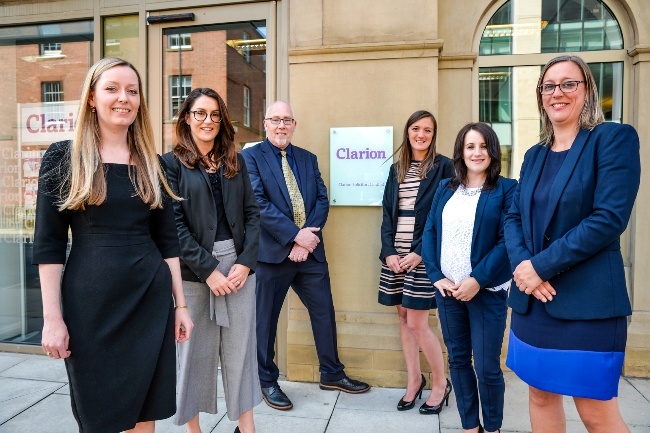 Seven lawyers at Clarion have been promoted as the Leeds law firm continues to invest in developing in-house talent within its 166-strong team. Deborah Warren, Fiona Marr and Rachel Dean have all risen to the position of legal director; while Kayleigh Fantoni, Victoria Clark, Russell Stevens and Joanne Chase have become senior associates. Roger Hutton, joint managing partner at Clarion, said: “While we are continuing to recruit the brightest talent, growing the team by 17 per cent last year, it is vital that we also provide a supportive environment where people enjoy working. “A key part of this is enabling the team to develop their skills and grow their careers with us, and I’m very proud that so many of our lawyers are being recognised with these promotions. Newly appointed legal director Deborah Warren joined Clarion in 2007, qualifying into the employment team before being promoted to senior associate in 2015. She deals with all aspects of strategic people issues, including TUPE transfers, collective redundancy consultation, determining employment status issues and dealing with Employment Tribunal claims, including complaints of discrimination. Deborah was shortlisted for Rising Star at last year’s Yorkshire Lawyer Awards. Since her arrival seven year ago, Fiona Marr has become a key member of the commercial practice, rising to senior associate in 2014. She is highly skilled in the drafting and negotiation of contracts including supply contracts, purchase agreements, agency agreements and the preparation of more bespoke commercial contracts. With 16 years of experience, 13 of them with Clarion, Rachel Dean was promoted to a senior associate in the corporate team in 2008. She has a strong track record of advising on all aspects of corporate work including corporate finance, in particular mergers and acquisitions and corporate reorganisations and general corporate governance, with specific focus on owner managed businesses. In addition, Kayleigh Fantoni, who joined Clarion’s commercial dispute resolution and litigation practice last year and was listed as a “Next Generation Lawyer” in the latest Legal 500, has been promoted to senior associate; together with Victoria Clark, who joined Clarion in 2010, and rises to the position in the employment team. Finally, after joining Clarion’s corporate recovery and banking team as a legal assistant five years ago, Russell Stevens has also become a senior associate, alongside legal costs lawyer Joanne Chase following three years with the firm.